Famous the world over, cognac’s delicacy is the result of its excellent home terroir, a mild and temperate climate and the talent and passion of the people who’ve been producing it since the 15th century. Did you know that traces of the first vineyards in the area date from the 1st century A.D? ? 98% of all cognac is exported, going to 160 countries. In 2016, almost 180 million bottles were sent to all four corners of the globe! Unlike other famous spirits, cognac is made from grapes. Its slow, complex production draws on a skilled alchemy performed by experts, including winemakers, distillers, coopers and cellar masters. 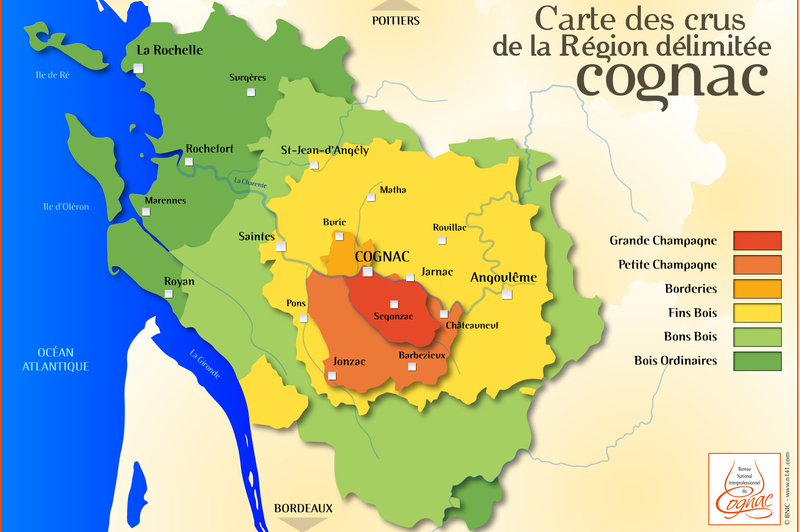 In 1936, cognac was officially granted the status of an appellation d’origine contrôlée (protected designation of origin). The extremely precise specifications forAOC cognac govern each stage of its production and distribution. They guarantee and protect the quality and name of the product, which alone has the right to call itself “cognac”. The cognac production area: super-size! As we’ve mentioned, not just anything can call itself cognac: only brandies from the designated area can use the name (or the term cognac brandy). This region, designated in 1909, covers more than one million hectares (an area almost the size of Lebanon!) and encompasses Charente-Maritime, large swathes of Charente and a handful of parts of Dordogne and Deux-Sèvres. 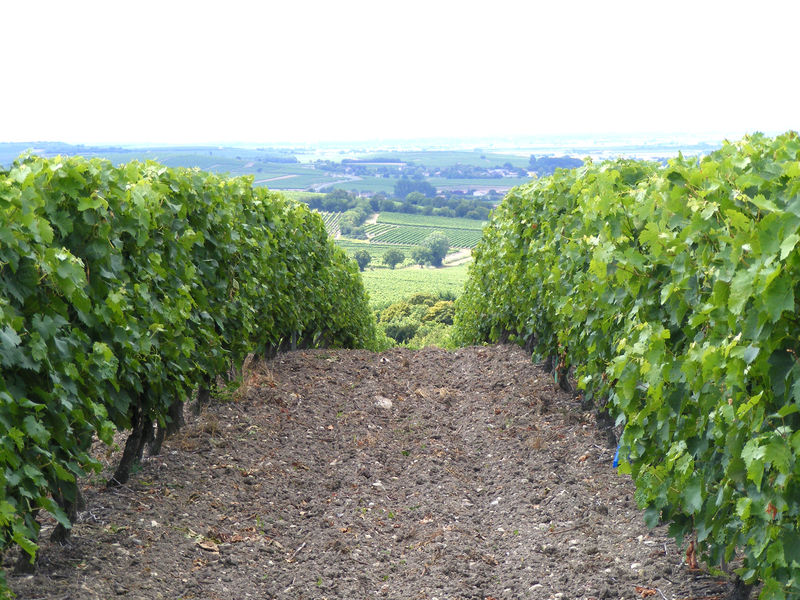 The Cognac vineyard, which covers almost 75,000 hectares, is the biggest white-grape vineyard in Europe. The character and personality of the brandies produced by this enormous vineyard are intimately linked to the characteristics of the soil, and the cognac production area has therefore been divided into six crus. The cognac vineyard counts around 4,500 winegrowers, each producing the white wine that will eventually be transformed into cognac. The main grape planted is Trebbiano (along with, to a lesser extent,Folle Blanche and Colombard), which are then divided into six crus which each radiate out from a central point and represent a soil, an area and a landscape. Grande Champagne and Petite Champagne (no relation to the famous sparkling wine, but to the Latin Campania, meaning “great plains”) are the heart of the vineyard. They produce very fine brandies with flowery bouquets that require lengthy aging. Borderies, which are round and sweet, provide violet and iris aromas. Fins Bois produces bouquets that suggest pressed grapes and its brandies mature quicker. Bons Bois, spread out among other crops and forests, provides fruity aromas. Bois à Terroir, which flourishes in the sandy soils next to the ocean and on the islands, offers a unique rustic flavour. From planting a vine to creating a cognac, you can’t rush nature or hurry; here, the passage of time is an important ally. Several years, even several decades, can pass by between harvesting the grapes and enjoying the cognac. Straight after the grapes are harvested (which some wine producers still do by hand, generally at the start of October), they are pressed and the juice fermented. The white wines produced have a very low alcohol content, allowing for a good concentration of aromas and high acidity levels, which in turn means they can be preserved naturally. Distillation: when the stills are bubbling, the vineyard’s buzzing! Cognac is produced by doubly distilling the wine in copper stills heated by a direct flame – that’s what makes it unique. Did you know that seven litres of wine must be distilled to produce one litre of brandy? During the winter months, Charente’s distilleries work day and night. The distillation cycle lasts around 24 hours and requires the constant attention of the distiller. In winter, the whole vineyard throbs to the rhythm of the distillation cycles and the low bubbling of the stills. Enter a warm distillery, watch the stills shimmer with coppery light, smell the delicate aromas that envelop you and listen to the distiller as he or she reveals the secrets of distillation, “cuts” and the “bonne chauffe”! Each winter, the Les Etapes du Cognac (Stages of Cognac) association brews up a programme of events so that visitors can share the unique experiences of the “Distilleries en Fête” festival. Aging is a vital stage in turning a brandy into a cognac. During its long – sometimes very long – stay in an oak barrel (aging can take several decades), the brandy is safely tucked away in the shadows of a cellar as it evolves, transforms and becomes smoother, taking on the aromas and character of the wood. Clear when it goes into the barrel, over the years it takes on different shades, from golden yellow to fiery brown. Cognac is the result of blending brandies of different crus and ages. Some cognacs require more than one hundred different brandies! This stage requires a highly sensitive nose, an exceptional olfactory memory and, above all, experience and intuition that take years to develop. Blending is entrusted to the cellar master who, like a perfumer, selects and combines the brandies, balances them, matches their characters and brings out their nuances to create not just cognac, but a unique cognac. You too can become a master blender during a workshop with the Maison Camus to create your own cognac – what could be more sophisticated? References to aging reveal the age of the cognac; given that it comprises a blend of brandies of different crus and ages, the age of the youngest brandy is what counts. A cognac remains the age it was when bottled because, unlike wine, its alcohol does not change once it’s inside the glass. 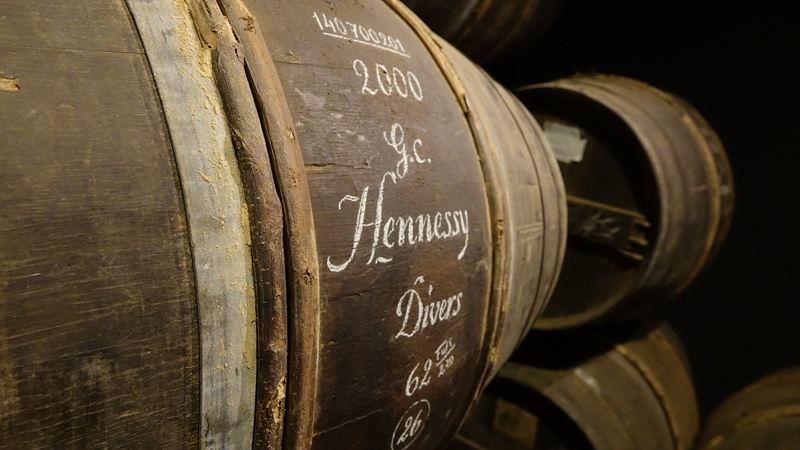 In general, cognac producers use brandies that are significantly older than the minimum required. VS (Very Special): cognacs whose youngest brandy is at least two years old. What about Fine Champagne? Fine Champagne isn’t a cru, but a cognac resulting from brandies exclusively from Grande and Petite Champagne. They must be at least 50% Grande Champagne. These references are optional. The only obligatory parts of a cognac label are the appellation, the alcoholic strength (which is at least 40%) and the volume. Want to try a cognac from the year of your birth? As we’ve said, a cognac is the result several expertly alchemised brandies of different ages and crus. Vintage cognacs are therefore quite rare and they’re subject to extremely strict monitoring to guarantee their authenticity. Watch out for visiting angels… While aging in the oak barrels, the alcoholic content and volume of the cognac decreases. This significant natural evaporation (enough to fill 22 million bottles each year) is poetically known as “the angels’ share”. A little bit of paradise… Paradis is the name given to the cellar where the oldest brandies are kept. Once they’re mature enough, the brandies are transferred in big glass containers called demijohns: from then on, they will not evolve further and can be kept for several years.